DXC Technology and Amazon Web Services (AWS) are joining forces to build a new integrated practice focused on delivering IT migration, application transformation and industry-specific cloud services. The multibillion-dollar DXC - AWS Integrated Practice is part of a multi-year, global agreement that also encompasses joint development, marketing, sales, and delivery of AWS solutions. Specifically, these services include managed security and compliance services for AWS; dedicated VMware Cloud on AWS migration solutions and analytics and application services on AWS. This is in addition to mission critical support for SAP on AWS and DXC managed services for AWS underpinned by DXC Bionix, which is a digital generation services delivery model providing intelligent automation. "Today's agreement combines DXC's deep expertise in enterprise services and industry-specific IP with AWS cloud to speed our clients' digital transformation," DXC chairman and CEO, Mike Lawrie, said. Meanwhile, AWS CEO, Andy Jassy, said the agreement represents a commitment for both DXC and AWS in the market. Such a commitment spans long-time and newer DXC clients, allowing the ability for customers to take advantage of the cloud with the most functionality, innovation, the largest partner ecosystem, and experience at helping companies run at scale. DXC is already a Premier partner in the AWS Partner Network (APN) and is an audited AWS managed service provider. Furthermore, the technology giant retains more than 8,000 AWS business and technical professional accreditations, which is the most held by one company outside of AWS. In addition to this, DXC also holds more than 900 AWS certifications including associate and professional level certifications, with plans to double that number in the next year, as part of the DXC AWS collaboration. According to IDC chief analyst, Frank Gens, partnerships like this will help "turbocharge" the move to public cloud, while creating digital offerings that transform organisations, enrich relationships with partners, customers and prospects. "Public cloud adoption is accelerating in large part as enterprises recognise that the cloud has become the launchpad for virtually every new IT innovation in the last 24 months - including AI, blockchain, quantum computing and more," Gens said. "Organisations not on the public cloud will be increasingly isolated from the world of tech innovation." DXC Technology’s business in Australia pulled in revenues of just over US$1.69 billion (A$2.26 billion) for the company’s financial year ending March 2018, topping off a lengthy period of acquisition and consolidation for the multinational IT services giant. The latest figures, outlined in the US-headquartered company’s annual report for the year ending March, largely reflect the additional earnings the company has picked up since its merger with Hewlett Packard Enterprise’s (HPE) Enterprise Services business. 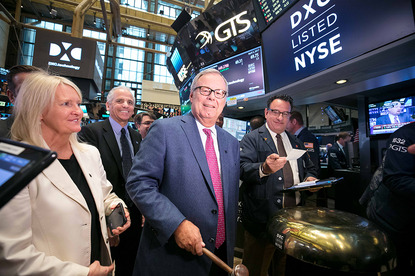 The US$8.5 billion spin-merger of the Computer Sciences Corporation (CSC) and HPE’s Enterprise Services business closed on 3 April last year, resulting in the combined company, DXC Technology.